The Play command is used to play a wav or mp3 sound to the parties of the conversation (caller, callee or all). You can see how to use this command in a HTTP request and what HTTP response you will get from the phone system (Figure 1). Step 1: Make a call between two extensions. Use ListActiveCalls command to find the call ID of the call you want to play a sound file to. You can find the CallId in the response, between one of the <CallId></CallId> nodes. 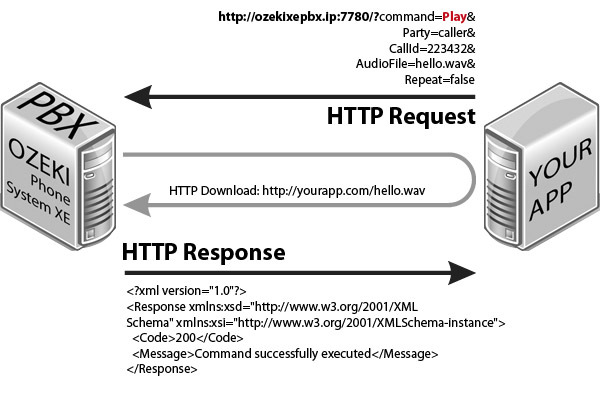 Step 2: Initiate a play using a HTTP request as seen in the picture above. Paste the call ID you found in Step 1 in the CallId parameter of the request. Put the destination of the audio file into the AudioFile parameter. When a relative path is provided, it will be relative to ContentStorage/Static directory in Ozeki Phone System XE install directory. It can be a HTTP URL as well where it's downloaded from.